Hector McDONALD b. ~1806 Isle of Skye, Inverness-shire, Scotland, son of Hector McDONALD and Catherine NICHOLSON had a son John Samuel McDONALD with Margaret McPHERSON. John Samuel McDONALD was born in 1837 at Alvie Parish, Inverness-shire snd came to Portland on the "Tamerlane" in 1846 to be with his father, Hector. Hector had emigrated from Scotland to Sydney in 1836 where he worked for a number of years before working in Melbourne and partnering Kenneth McKENZIE in the "Snizort" Pastoral Run at Hotspur in south-west Victoria from about 1845. Hector McDONALD built the "Crawford Inn" at Hotspur and a bridge over the Smoky River next to the Inn. The location of the Inn was on the southern bank of the Smoky or Crawford River not far from where the photograph on the right was taken. Hector McDONALD later moved to Portland where he built "Mac's Hotel," still a significant landmark in Portland, before he died there in 1859. Hector Andrew McDONALD, b. 1875, d. 1875, Harrow, S-W Vic. Margaret Adam McDONALD, b. 1876, Dartmoor, S-W Vic., d. 1957, Portland, S-W Vic. Grace McDONALD, b. 1879, Dartmoor, S-W Vic., d. 1960, m. James Iverach GREENHAM 1880-1942. Andrew John McDONALD, b. 1882, d. 1882, Dartmoor, S-W Vic. Flora Isabella McDONALD, b. 1883, Dartmoor, S-W Vic., d. 1959, NSW, m. Arthur Hosken NESBIT 1882-1936. Eliza McDONALD, b. 1886, Strathdownie, S-W Vic., d. 1981, Tas., m. David Henry WEDD 1886-1975. Jessie McDONALD, b. 1888, Alvie, Vic., d. 1968, Melbourne, Vic., m. Francis Daniel RAGGATT 1885-1963. Christina "Teen" McDONALD, b. 1894, Strathdownie, S-W Vic., d. 1980, Melbourne, Vic., m. Edwin James WARREN 1889-1967. Alvie Sorlie McDONALD, b. 1897, Strathdownie, S-W Vic., d. 1984, Hamilton, Vic., m. Rose Louisa HUGHAN 1897-1978. Hector McDONALD married in 1844 at Melbourne to Charlotte McDONALD b. 1818 Inverness-shire, Scotland, daughter of John McDONALD and Isabella STEWART. 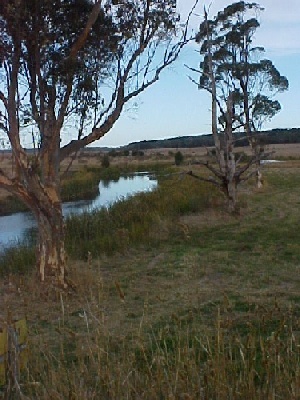 Hector & Charlotte moved to Hotspur on the Smoky River in S-W Victoria, where he took up a partnership in "Snizort" Pastoral Run with Kenneth McKENZIE. He also built and operated the "Crawford Inn" at Hotspur and later, "Mac's Hotel" in Portland. Hector was the brother of John McDONALD who arrived at Hotspur in 1853 after emigrating with his wife and family to Portland on the "New Zealander". Hector McDONALD died in 1859 at his "Mac's Hotel," Portland and was buried in the North Portland Cemetery. Charlotte McDONALD, widow of Hector was licensee of "Mac's hotel" for 7 years after Hector died in 1859. She later lived in Melbourne and died in 1903 at "Ennerdale" near Camperdown, the property of her son-in-law, John ROBERTSON, and was buried in the Melbourne General Cemetery. John ROBERTSON had married two of her daughters who both died after childbirth in the 1880s. Hector McDONALD was listed as an early landowner on the Hotspur Parish map. He occupied the pastoral lease of 'Snizort' from 1845 to 1854 with Kenneth McKENZIE. James HAMILTON recalled as a ten year old, in 1848, from Ozenkadnook Station north of Casterton taking a dray load of wool through Digby and Hotspur to Portland. Allan McDONALD b. 1857 Smoky River (Hotspur), Vic d. 1858, Portland, Vic.